Following some fairly intensive work by testers (thank you everbody! ), we’ve updated the Open Voice Factory as well as its CommuniKate templates. This has fixed one bug made one design change, and added one feature. The bug was relatively simple – the colour wasn’t been read from some PowerPoint cells correctly, which meant that they would take on the colour of whatever that cell had been on the previous page. The feature was pretty simple as well, we added capital letters to the pagesets CommuniKate 12 and CommuniKate 20. The design change was a little more involved. Some AAC functions are a little more complex than others. So while linking from a grid cell to another page is easy – making a cell clear the message window is a bit more difficult. 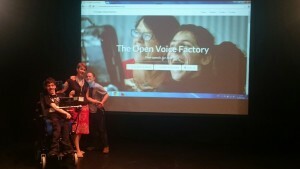 These changes are now up on GitHub and live at the Open Voice Factory website. They are also backward compatible – old designs that you have been testing will still work (although they will still show the colour bug, and they will only work on newer versions of PowerPoint). Next on our todo list to to produce some instruction videos that go into the topic of special commands in more detail.